The Columban Fathers’ mission of spreading the Gospel message across the world has been honoured at a Mass to celebrate the order’s centenary. Source: The Catholic Leader. The Mass of Thanksgiving at Brisbane’s St Stephen’s Cathedral on October 7 celebrated the Missionary Society of St Columban evangelising the world. Among the concelebrating priests were five Columbans – Fr Noel Connolly, Fr Gary Walker, Fr Warren Kinne and Fr Trevor Trotter; and Fr Brian Vale, from New Zealand, who was recently elected as the Columbans’ vicar general. The Columbans were founded in 1916 as the Maynooth Mission to China, and were granted formal approval two years later. 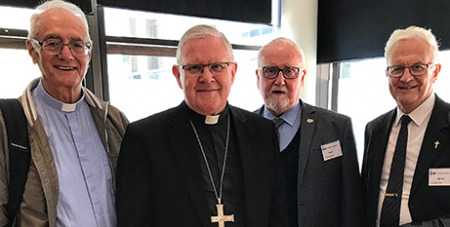 Brisbane Archbishop Mark Coleridge spoke in his homily about the missionary work of the Columbans, and how he learnt about their work during four years living at a Columban house in Rome. The Columbans are a missionary society of secular priests, and therefore is not a religious congregation. There are 381 Columban priests and 50 lay Columban missionaries working in areas such as justice and peace, interfaith dialogue, and care for the Earth. They can be found in Ireland, Britain, Fiji, Taiwan, Japan, The Philippines, Korea, China, Myanmar, Pakistan, Chile, Peru, Australia, New Zealand and the United States. Their work brings them to the margins of society and often into danger – 24 Columbans over the past 100 years have died violently while on mission. “We started in China but have networked in many countries,” said Fr Kinne, 72, who was born and bred in Bundaberg and spent two decades as a missionary priest in China. “What brought us together was the idea of working in another culture – crossing boundaries of culture and religion and language for the sake of the Gospel. “We’d set up the local Church and then move on.